Ellentriek – Page 2 – (low) voltage fun with 220V and everything below! Research, experiment, creation, inspiration, education, cooperation! One of the Constant members is going to Dakar, to give a workshop, and lots more. So for this, we decided to give some pretty chips to take along- electronics are not so easy to get in Senegal. 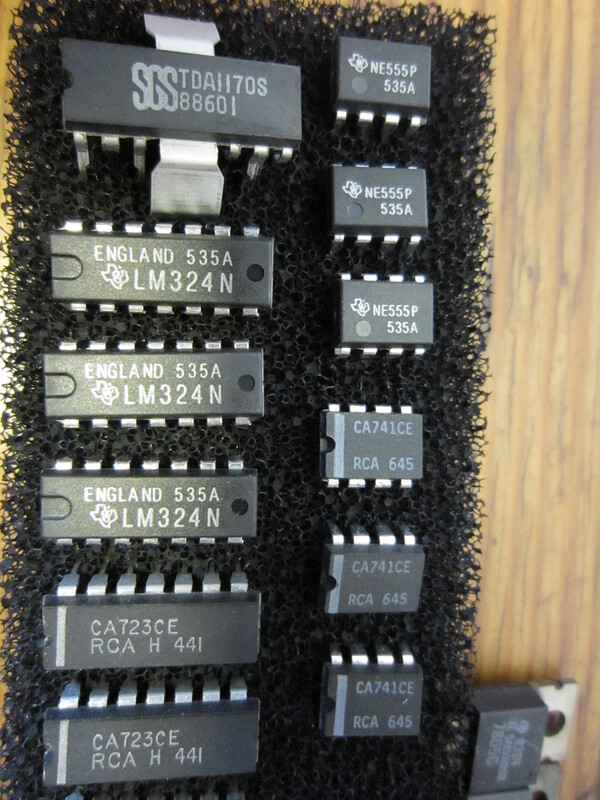 A few 555 timers, opamps, pretty blue dip switches – there was very little time to get this package together. So – enjoy, it in Senegal! Ellentriek #13 – Audio – The pictures of part one! 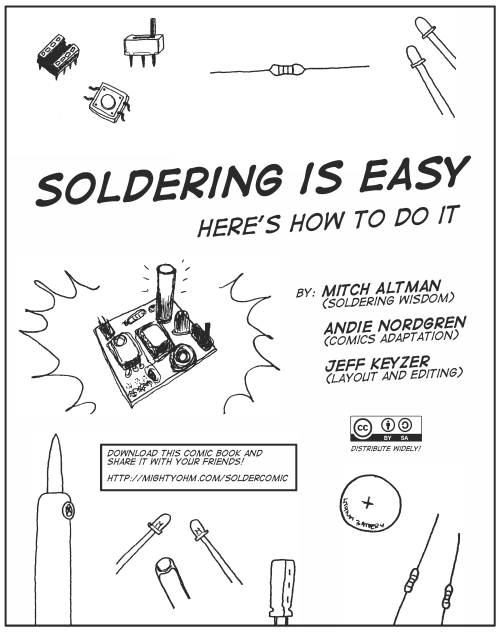 Hacker and inventor Mitch Altman, Andie Nordgren and Jeff Keyzer teamed up to make the “Soldering is Easy. Here’s how to do it” comic book. 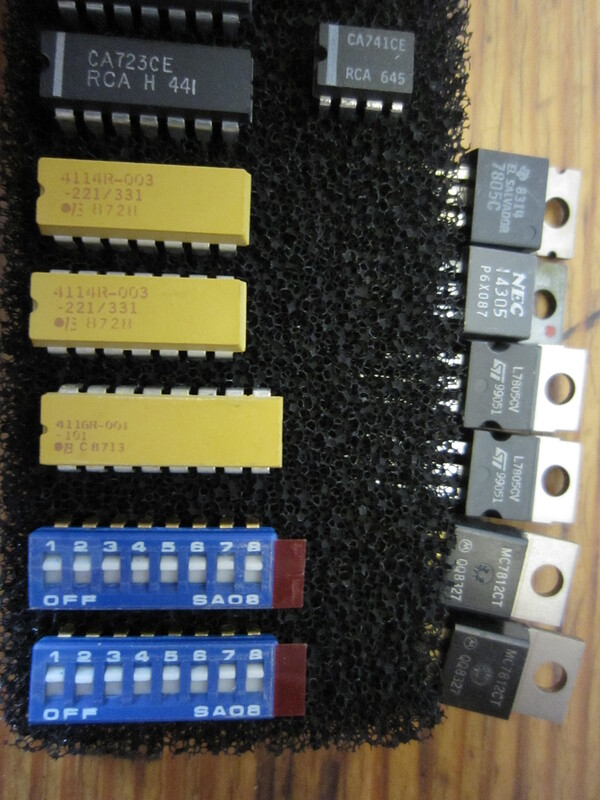 Altman often travels the globe, to introduce people to soldering, and of course, linked to that, soldering is also an introduction to the innards of technology. This pdf has been published under an open Creative commons license. A book – physical world – will follow. I’ll try to follow up how they will deal with licensing there. In any case – another sweet reference for beginners. For sure it will be part of the Ellentriek library! DIY Day is looking for participants! installations, markets and much more for all ages! contactmic sculptures, ... and some noize with Nohmad sound! interest and organizing a day for everybody! help during DIY DAY is more than welcome!! (maybe even do a demo or small workshop), hang around, have fun! Imagine a rainy summer day, a motor, a toothbrush and a battery, all ingredients for fun day making a bristlebot. But no such luck. Noa and his friends’s bristlebot kept flipping over, probably because the motor was a bit too strong for the toothbrush. But, the holiday tinkering spirit was strong that day, so, they also did experiments with Catamaranbots, which they kept on sailing in circles. Kitchen Budapest is looking for stupid Robots! Call for applications! 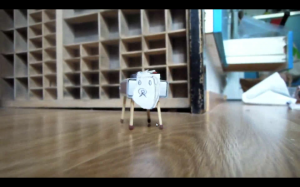 Submit your stupid robot idea and be one of the lucky winners who will participate at the show! Anyone from Europe over the age of discretion; anyone from Europe under the age of discretion with the permission of an adult representative. Application can be individual or team-work. In case of teams applying, they have to be represented by an individual who is in contact with the Organizer. Applicants must hold the intellectual property rights to the work submitted and be the legal originators of the creative product or project. In order to apply you need to upload your project to bacarobo.kibu.hu. Applicants can upload a max. 150-word-long description of their project in English, max. 3 JPG photos (up to 2MB each), and 1 video (max. 3-minute-long) uploaded to youtube/vimeo/other online video webpage. Your robot has to function mechanically. E.g. making a paper-mache is not suf?cient, it must have some kind of mechanical feature. Your robot must be meaningless or worthless. It must not have a reasonable goal or practical function that may be useful for the society, instead, it should have some stupid aims. Your robot must make people laugh. BACAROBO must be made to entertain and surprise people by its stupid action, function or its humorous system. You will have 3 minutes to set it up. After the setting up has been completed, the truck has to be moved from the backstage to the stage. Maximum 2 assistants may help handling the robot during the performance. Your robot has 2 minutes for the performance. The applicant can only use a switch that can turn on and off the robot. There is no time extension in case the machine has errors during the performance. The project and all its related equipment should not exceed the width of 90cms and the depth of 120cms in order to be able to ride the trolley. The project’s height has to be within 180cms and it has to be within the weight of 80kgs. 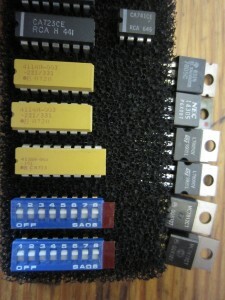 For powering the robot there is a 230V power supply (15A) available. Do not use any kind of liquid that can explode by a spark. On the day before the presentation day the authors will have the possibility to do a rehearsal with their robots if needed. Each applicant should consult this in advance. The transportation and costs of the robot have to be arranged by the applicant. In case of multiple applications from the same applicant, each project requires a separate registration.